Onstage: Michael Franti, pictured below, emerged as one of the most provocative and talented members of the crowded rap/hip-hop universe in the early 1990s. He formed the band, Spearhead, above, in 1994, as a diverse mix of organic hip-hop and pop. A master of contemporary protest music and an innovative songwriter, Franti strives to reshape that musical style from album to album — consistently challenging himself to seek fresh perspectives. at the Wellmont Theatre, 5 Seymour St.
show time is at 8 p.m.
Franti, who formed the band in 1994, is an acoustic guitar player and Spearhead's lead vocalist. He is a musician with a chameleon-like ability to reshape his musical style from album to album. As a performer, he continues to challenge himself to seek fresh perspectives. Tickets are $30 in advance; $35 on the day of the performance, and can be purchased at the box office, or by calling 877-WELLMNT (877-935-5668), or by visiting online at www.tickets.com. Michael Franti has been barefoot for 10 years now, and he's not looking for a pair of shoes anytime soon — at least not for himself. Instead the singer is raising money and collecting shoe donations for the nearly 300 million kids who have never had the pleasure of owning a pair of shoes. "It came about from traveling to a lot of places where kids couldn't afford to wear shoes. I'd play music on the street and the kids would follow me around and laugh at me when I'd take off my shoes. So I decided I wanted to toughen up my feet and I was going to go three days in San Francisco, where I live, barefoot. 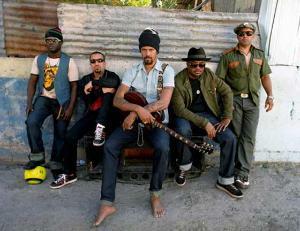 That three days has turned into 10 years now," Franti explained. The 44-year-old performer has partnered with an organization called Soles for Souls, and is doing 10 charity concerts this fall with the goal of raising 500,000 shoe donations. Franti is no stranger to the impoverished areas of the world. In 2005, he released a documentary that he directed, produced and wrote the music for. The film was called "I Know I'm Not Alone" and it showcased the musician's trip to Iraq. Franti said two things stood out the most during his time over there. One was a metal band he met while traveling through Baghdad. "They used to have to write songs in support of Saddam in order to even be allowed to exist. After Saddam, they were so grateful that he was gone, but they were also fearing for their lives because there were people that remembered that they had written songs for Saddam, and wanted to kill them because of that. These were just teenage kids who wanted to play rock music. I remember them telling me that when they would break a string on a guitar, they didn't have guitar strings. So they would use telephone wire and they would take the rubbing housing off of the outside of the wire and put it on the guitar as a string. I was just so moved by how dedicated they were to play music," Franti told The Times. The other thing that Franti remembers vividly was the vibe he got when he picked his own guitar to share his music over there. "Sometimes I'd sing these political songs, speaking out against war, and always without fail they'd say, 'That's really great, but play us something that makes us laugh and dance and sing and clap along.' It really changed the way that I viewed music and the way that it affects people in the world," Franti said. Taking this perspective with him back home, he spawned simple, feel-good songs like "Say Hey (I Love You)," which is now Franti's biggest hit to date, peaking at No. 18 on the Billboard charts in 2009. Continuing to follow this cheerful, upbeat theme, Franti's September release "The Sound of Sunshine" shares songs about friends, family, dance, and simple things like the sunshine. "I have a desire that I want to make people feel happy through my music," said Franti. "I'm always trying to find optimistic ways to express myself." As an activist, touring musician, and just a curious man, Franti has seen the globe inside and out, many times hanging out in the world's most poverty-stricken regions. Yet, he admits that despite their lack of wealth, the people in these areas have something most Americans don't. "The sense of community in those neighborhoods is so much deeper than what I've ever experienced living in America," said Franti, who recalled his experiences being welcomed into homes in Brazilian shantytowns. "I've always found that the poorer the places that I go, the more smiles I see, and the more happiness I see." The singer doesn't have a xenophobic bone in his body. Even at home in California, which is also home to America's largest population of illegal immigrants, Franti actually thinks the country is taking a hypocritical stance toward the hot-button issue. "Our country was founded on immigration. We are all occupying Native American land here. At what point do we say 'It's our land and nobody else can come here.'"